Tired of controlling Netflix and Hulu on your PlayStation 4 with an unwieldy game controller? Probably not, but it wouldn’t hurt to have a remote around, like this official one. It has buttons that make the PS4 and other devices do things. Oh here, I took a video. Being a universal remote, the device also controls things like the relatively old Westinghouse I have mounted far too high on my office wall. The automatic scan function didn’t work for the television, but three quick code inputs later I was powering it on and off like a champ. Having lost the original remote for this television years ago, I was finally able to navigate the menus and switch the screen to Game Mode, so that’s a thing. Look kids, it’s Yoda! You like Yoda. Cable boxes, audio amplifiers—this thing does it all, by which I mean everything you would expect it to. For $30 (cheaper than that at most places I checked) you could buy many things that do not control a PlayStation 4 and other devices remotely, but they wouldn’t...control a PlayStation 4 and other devices remotely. There are a few issues still being ironed out with the remote. You can’t back out of Hulu menus for one, so that’s a dealbreaker for the Hulu dependent. That and the volume control pass-through isn’t really a thing, so you’ll have to switch device buttons before turning your TV or amp sound up and down. Otherwise it does the things. 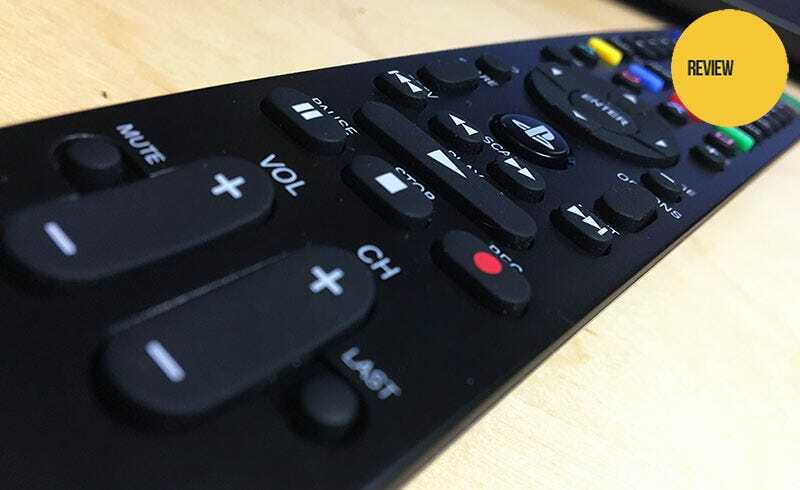 The PlayStation 4 Universal Media Remote by PDP. It’s pretty nice. Contact the author of this post remotely at fahey@kotaku.com or find him on Twitter@bunnyspatial.